Looking for a new binder to showcase and store your shiny collection of Series 2 My Little Pony cards? Enterplay has the solution with a brand new binder that came out recently in stores. I was able to find a few over at my local Walmart so here’s a “hooves on” of the new binder right after the break. The My Little Pony Twitter announced this morning that there will be a collectible card game to go with their series of trading cards, to be published by Enterplay. They will demo the game at gaming convention Gen Con, August 15-18th, in Indianapolis. 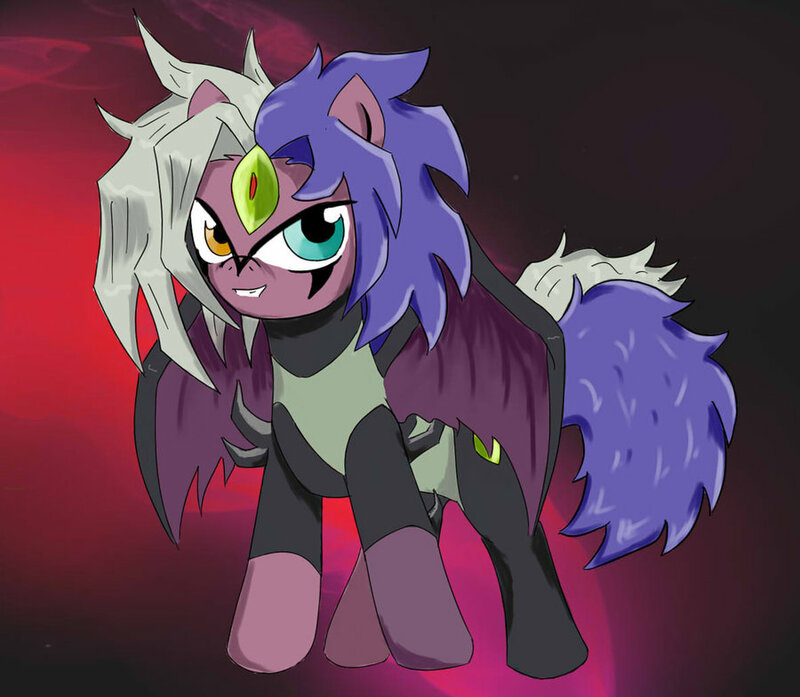 In a presentation to MLP fans on Saturday, August 3, Enterplay President, Dean Irwin, gave a sneak peek of their plans to introduce a fun new collectible card game based on Hasbro’s incredibly popular My Little Pony brand. The game, launching in November, will include traditional starter decks and booster packs. More information and game play demos will be available at this year’s Gen Con in Indianapolis Aug 14-18. 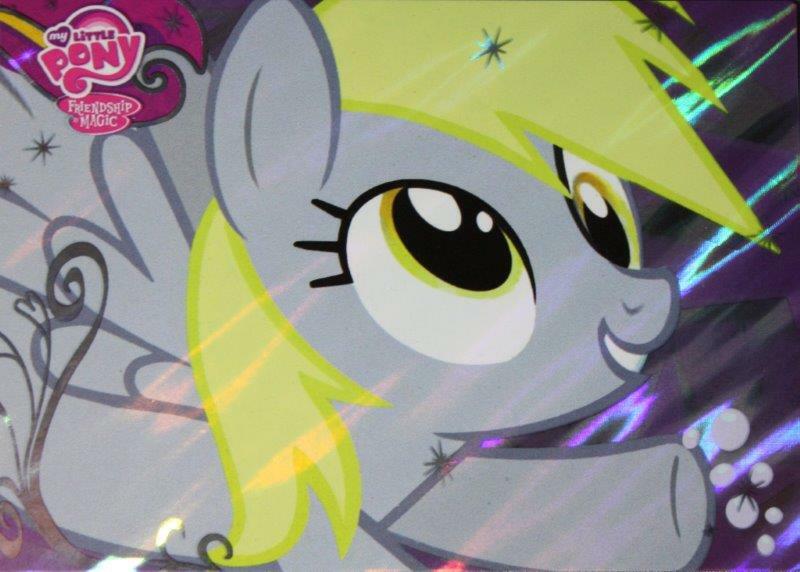 Enterplay is pleased to announce an exclusive foil Derpy card for their MLP Series 2 trading card set. This card will be available at Fiesta Equestria, taking place next week. All you need to do is present them with your badge at their vendor table. Ryan from Jabber Cards will be on hand to punch badges and offer binders, boxes, posters and cards to all the MLP FIM collector’s out there. Fiesta Equestria is just a week away and we have some exciting news for everyone! Enterplay is debuting card number F40 at Fiesta Equestria! In order to receive the card, show your badge to Ryan at the Jabber Cards booth in the Dealers Room. There is a strict limit of one per registration, so that all attendees have a chance to get this rare card! Although pre-registration is closed, it’s not too late to get your pass for Fiesta Equestria! Early bird registration will open Thursday night at the Marriott from 5-10 p.m. and you can register all weekend at the door. Speaking of Thursday night, we will be having a special sneak peak panel with some of the voice actors at 9 p.m. So come by, pick up your badge, and enjoy a more laid back atmosphere with some of our guests! You can find a general event schedule on our website with and can expect a final schedule to be published later this weekend to help you plan your Fiesta Equestria experience. We can’t wait to see you all down in Houston! Some people have been circulating card lists based on the cards in their own collections, but Irunachan on the MLP Trading Post found Enterplay’s own official list. The PDF (found here) is also a checklist. 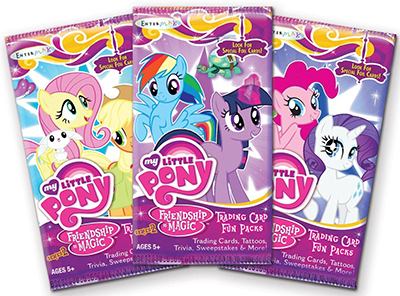 There will be 9 promo cards: Pinkie, “to be announced,” Rainbow, “to be announced,” Fluttershy and 4 more to be announced. 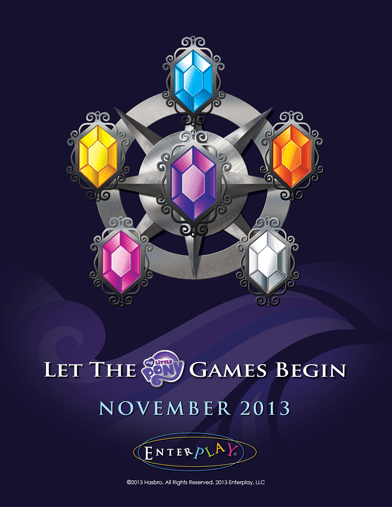 The Princess Twilight puzzle set is most likely the cards in the Enterplay/Ultra PRO album. Foil Stickers are not available through packs and will most likely be “promos” as well. It was mentioned a bit back that Enterplay was teaming up with Ultra PRO to make FiM licensed products, not naming what exactly they would be. 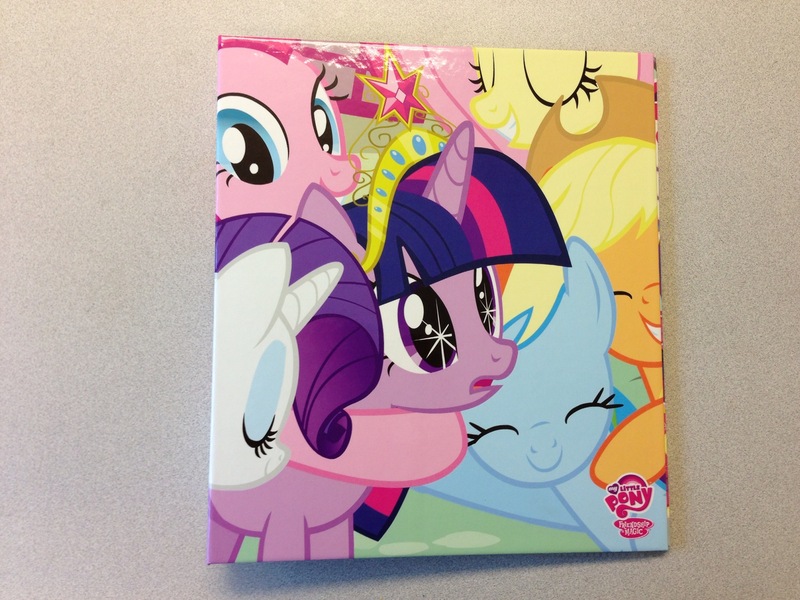 Inuranchan on the MLP Trading Post spotted on ToyWiz that Ultra PRO will be making the series 2 Enterplay binder. The listing is for a preorder to be shipped in June at a price of $19.99. The binder is case bound, which is a fancy way of saying hard bound or hard cover. This means something super high quality, as well as including 3 rings to fit card holding sheets. The binder/collector’s album will come with a card checklist and “an exclusive 6-card foil puzzle set.” It will probably not be the wife toss Cadance puzzle we’ve already seen finished via Big Apple Ponycon prerelease. I know a lot of you have been looking for this, and now you can go out and buy it. Celestia Wants Me For a Sunbeam on Ponychan found one at their local Walmart for $9.98. The box contains a single back of series 2 cards, a poster listing all the series 2 cards, a promo Fluttershy card and an exclusive Fluttershy sticker. Only one card pack is disappointing, but the release of this means that the card packs should be out any day now, if not already at your local store. For you folks out in the Enterplay Trading Card collection racket, the Series 2 cards are planned to drop sometime this month. I could not find an exact date but ToyWiz.com currently has the card packs on pre-order with a release date of “April 2013”. Recently Sparklepeep sent us an e-mail to an imgur album they created which features a complete set of pictures of the complete set of series 2 cards. Picture resolution is high enough that you can make out what the backside of the cards say. Many people have been talking about this series recently as it was discovered the Sweetie Belle card contained the phrase “cutie mark acquisition program” on it, a phrase known from the fan series Friendship is Witchcraft. The reason behind this is namely Enterplay’s connection with the community as their vendor booth has become a staple at pony conventions, and the fact many of the people originally hired to create this series were pulled from the community itself (fun facts). The above image shows a set of 9 puzzle cards that form a picture of Spike riding Cadance. Cards are currently available for pre-order from ToyWiz.com, currently $12.99 for 5 Fun Packs and $52.99 for the Fun Pack Box (30 packs).